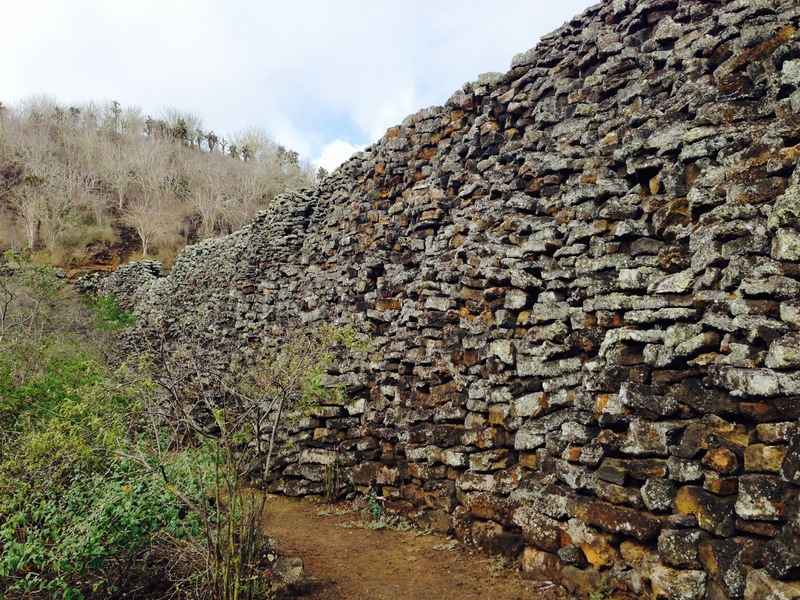 Lots of exciting adventures filled our last full day in the Galapagos. Last night our ship traveled for about five hours through a rain storm and busy ocean to get to Santa Cruz island so we were ready to disembark in the morning for Puerto Ayora, the largest city in the Galapagos. I think I can now safely say that I do not get sea sick. When we awoke it was still raining, and we were preparing to get out our rain gear, but right before breakfast, the sun came out and a huge rainbow appeared. We said good-bye to our amazing crew and got in the pangas for the last time. Our first stop was the Darwin Research Center and Tortoise Breeding Center where turtles and tortoises from the various islands are kept in captivity and cared for until they are two or three years old and then are released. Contrary to most of the vegetation we had seen on the other islands, the southern part of Santa Cruz island was lush and jungle-like. It was delightful to have time to stroll through the little pathways and the town. 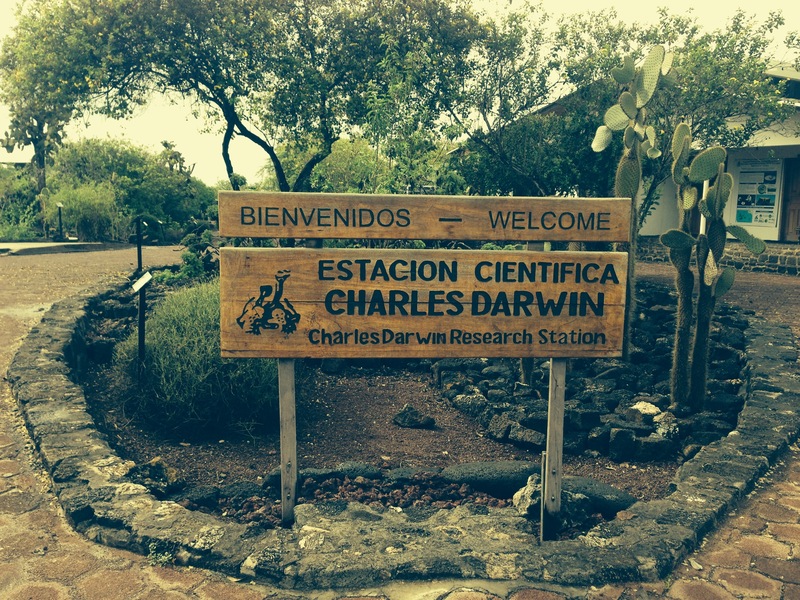 It was exciting to be where Charles Darwin had conducted some of his most important research. 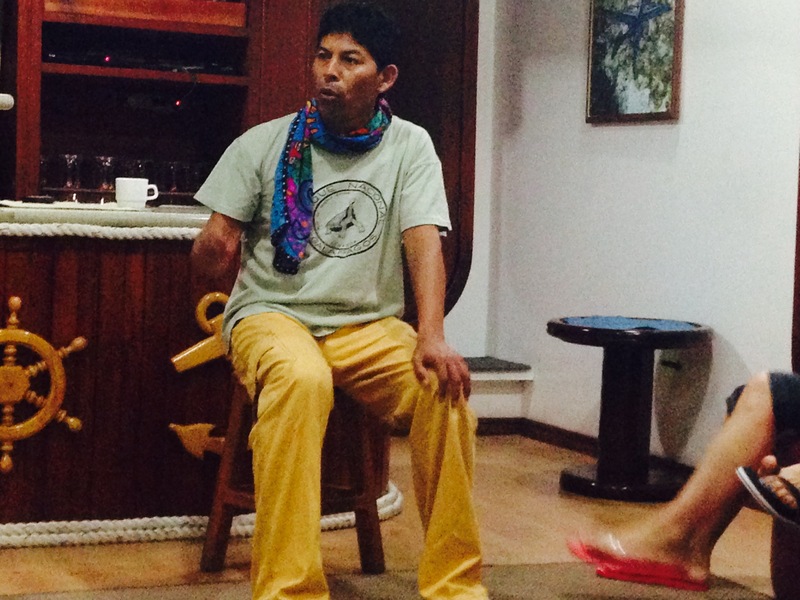 Our guide told us that Darwin got sea sick easily and was happy to be off his ship and in Galapagos conducting his research. His observation of the thirteen different types of finches in Galapagos and how they adapted to their environment contributed to the development of his theory of evolution. Because of their role in the development of Darwin’s theory, they are referred to as Darwin’s finches. 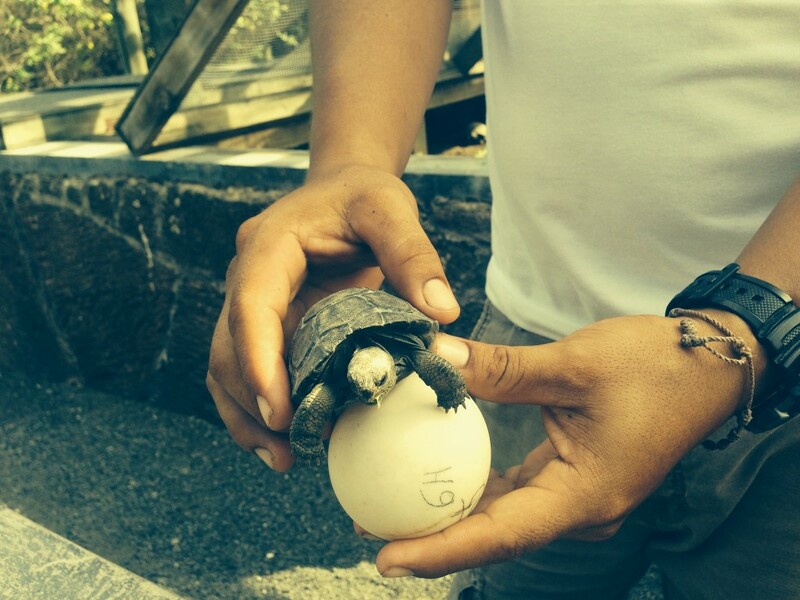 Tortoise eggs and baby tortoises have many predators, and through the work of the various tortoise care centers, Galapagos is working hard to increase the number of tortoises. After visiting two centers to see tortoises in captivity, it was exciting to go to an area where we could see tortoises in the wild. 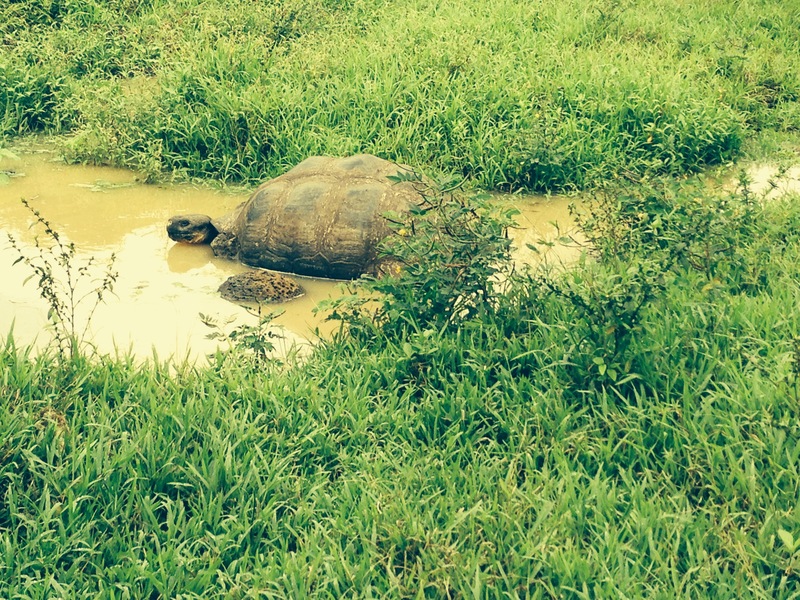 After donning rubber boots, we hiked a loop that took us by a large number of tortoises. We were lucky to be able to see so many tortoises because we were there at the end of the mating season and the rain the night before drew them to the puddles along the side of the path. Tortoises can go a year without eating or drinking anything, so I think they were all taking advantage of the readily available water. Our last stop was at a coffee and sugar cane farm. 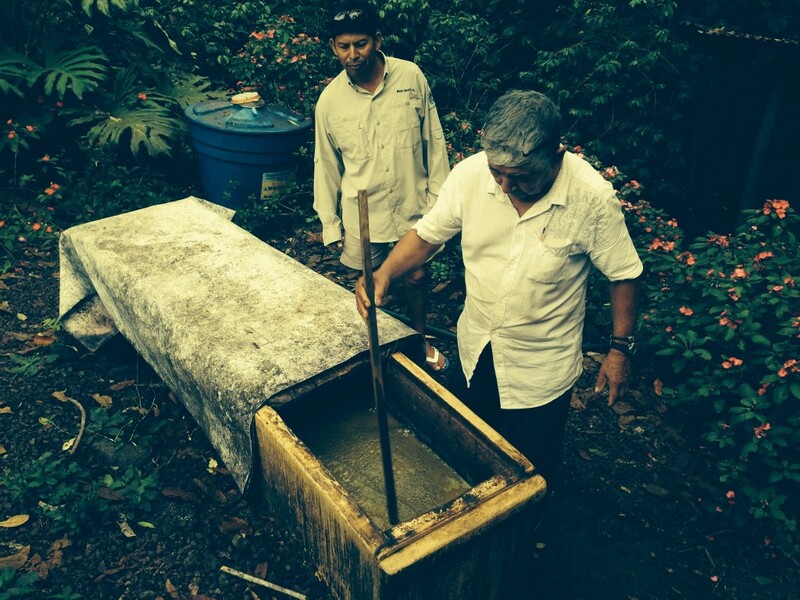 The farmer uses the syrup from the sugar cane to make brown sugar and a special rum. 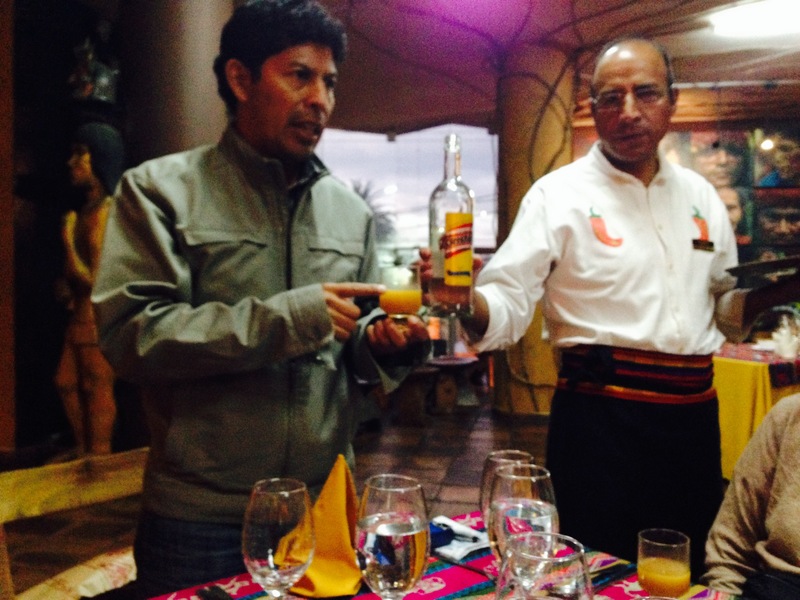 We were able to taste both his wonderful coffee and a drink made with his special rum. Like everything grown in Galapagos, the coffee is organic. 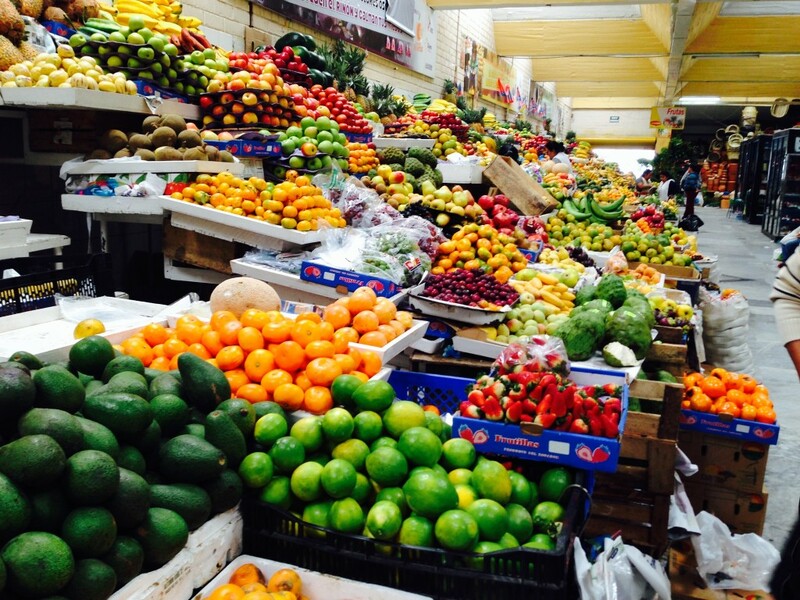 When we left, the farmer’s son thanked us for buying their products and helping to support their family business. 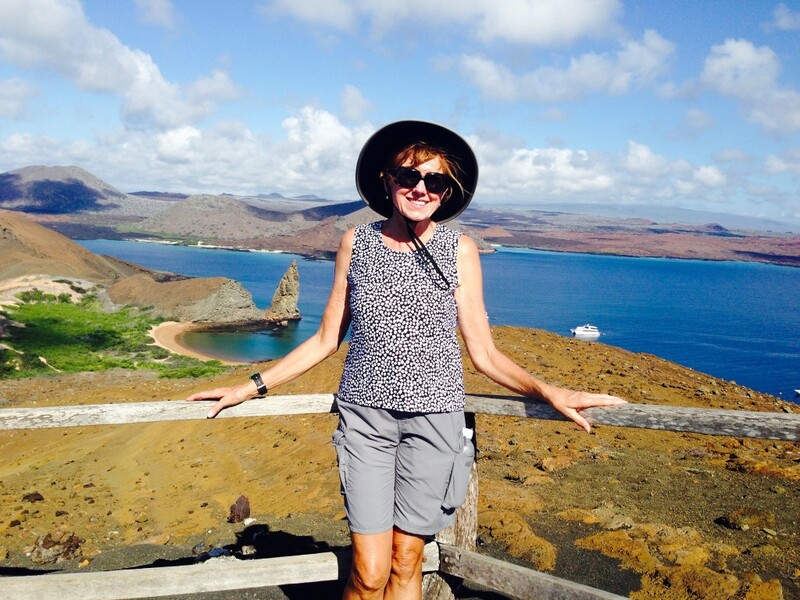 I will be sad to say good-bye to the Galapagos when we fly back to Quito. It is a most enchanted place of wildlife, natural beauty and dedication to conservation. 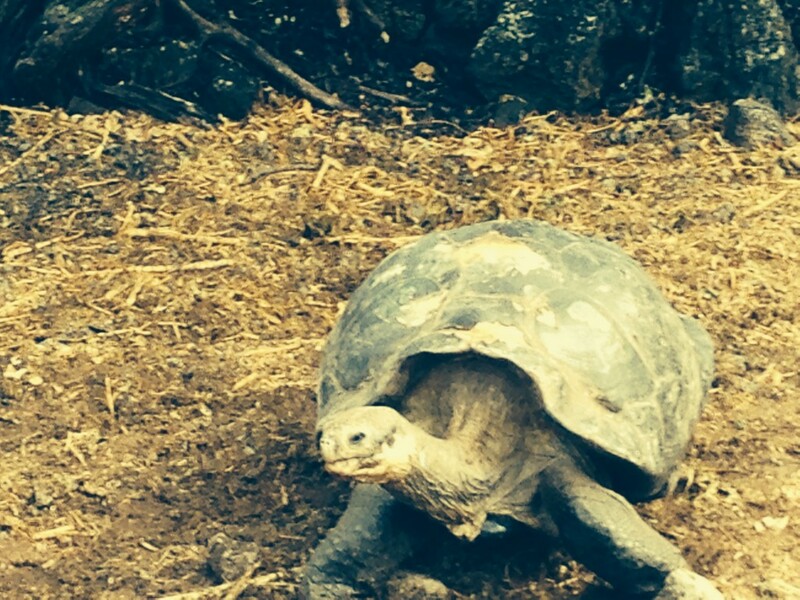 Our guide told us that ten years ago Galapagos looked to Costa Rica as a model of conservation. Now Costa Rica is learning from Galapagos. 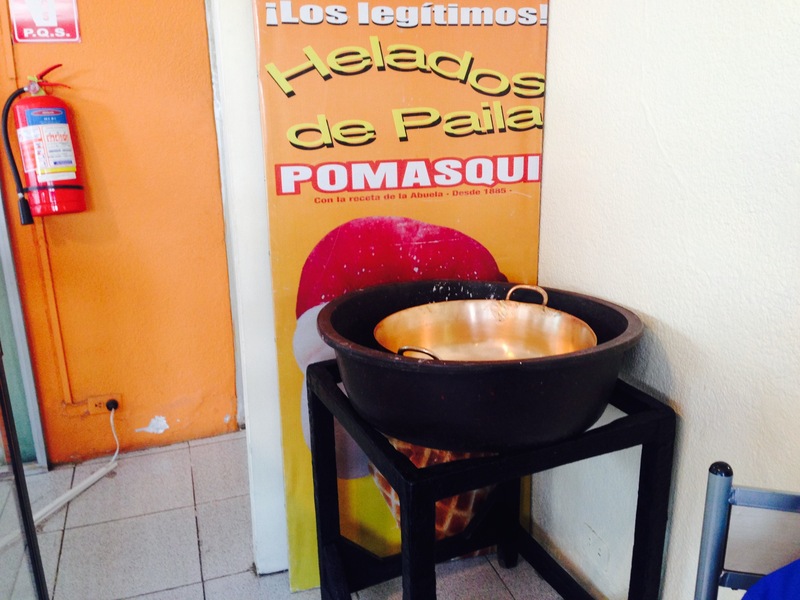 This entry was posted in Peru 2014 on May 4, 2014 by debbie. 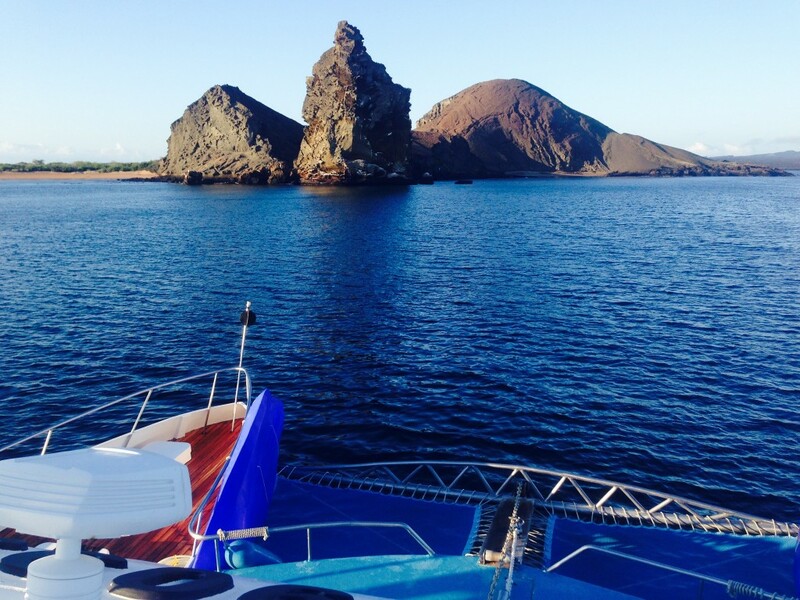 During the night our boat traveled to a new island and we awoke to this beautiful view of Pinnacle Rock on the island of Bartolome. After breakfast we got in the pangas and headed to Bartolome Island. This island is such a popular hiking destination that the park service installed a wooden walk way up the dark lava sand hillside. 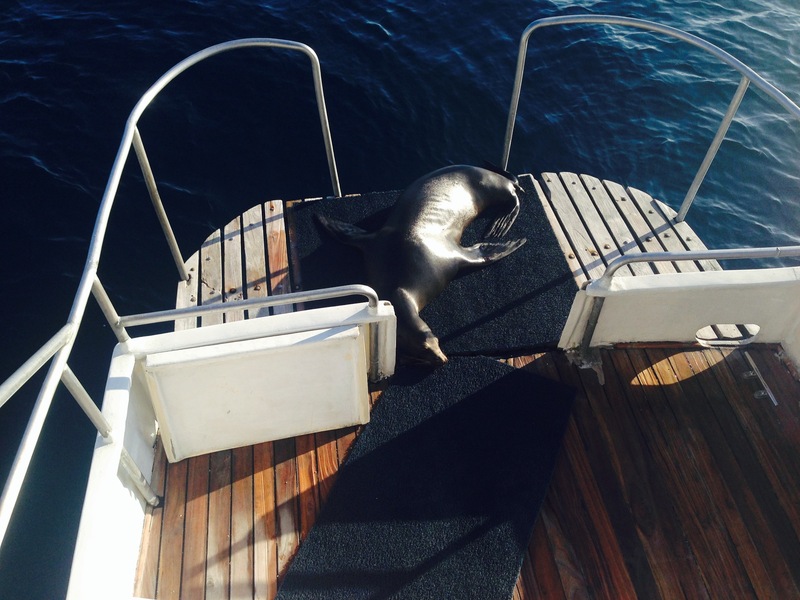 Before we could get off the panga, one of the crew had to encourage a sea lion who was sunning on the landing to move out of our way. 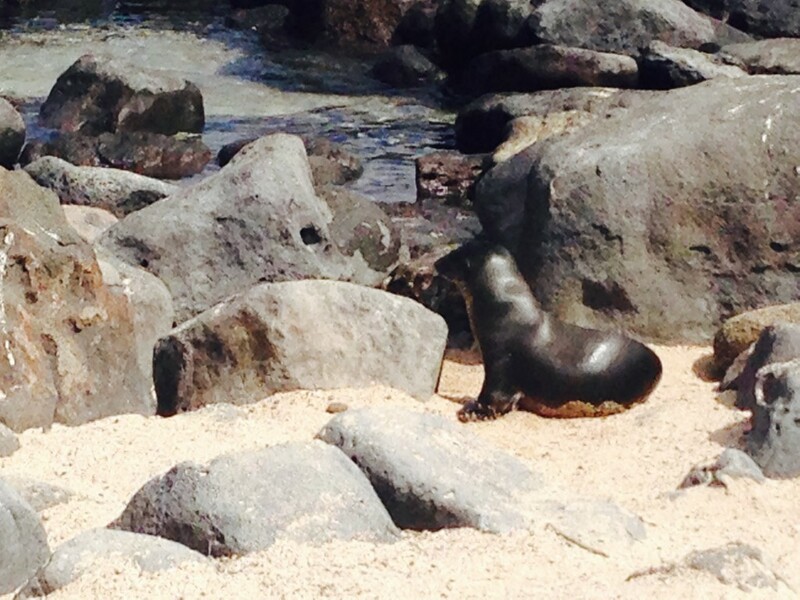 Sea lions are everywhere around here. They get on boats, park benches, rest areas, stairs, boat landings. As we started up the walkway, our guide pointed out a little crater to the right that formed a small pool at low tide. From the top of the hike, we had a beautiful view of the trail and the crater pool. We had our first wet landing today when we took a panga to a lovely beach and hiked to the other side of the island. Along the walk we saw turtle nests and a Galapagos hawk. Then we hiked back and did some snorkeling. After lunch we did another snorkel around some big rocks. 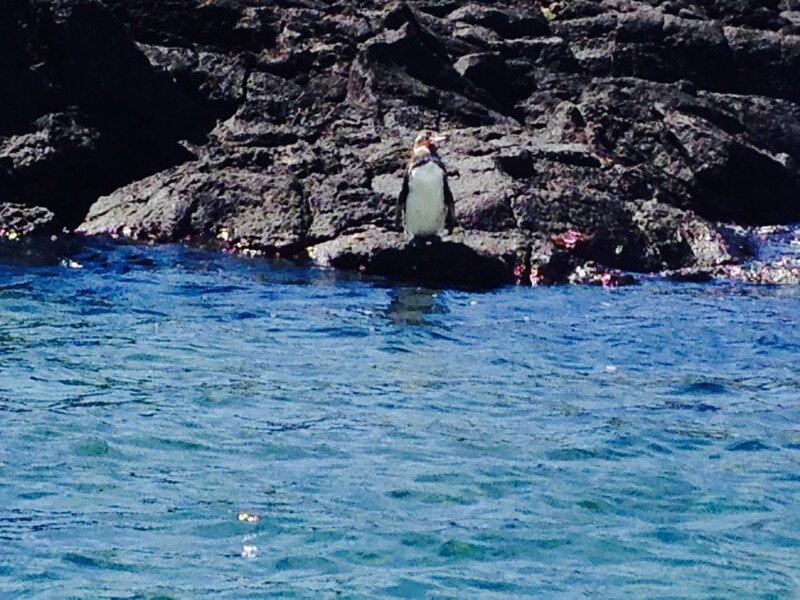 We were excited to spot a Galápagos penguin, the smallest of the penguins. Our last hike of the day was to James Island where we walked on basaltic lava. Unlike the brown lava soil of our morning walk, this was shiny black. 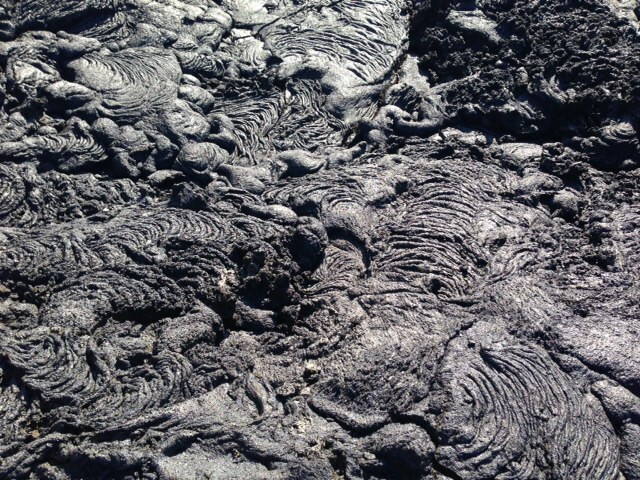 Because the lava was only 120 years old, it was still wavy and rough. It was easy to imagine the molten lava pouring down the hill. Before dinner our guide talked with us about some of the current issues in the Galapagos. Although Ecuador adopted the US dollar as its official currency in 2000, the Galapagos had been using the US dollar since the 1940s when a US air base was stationed there. 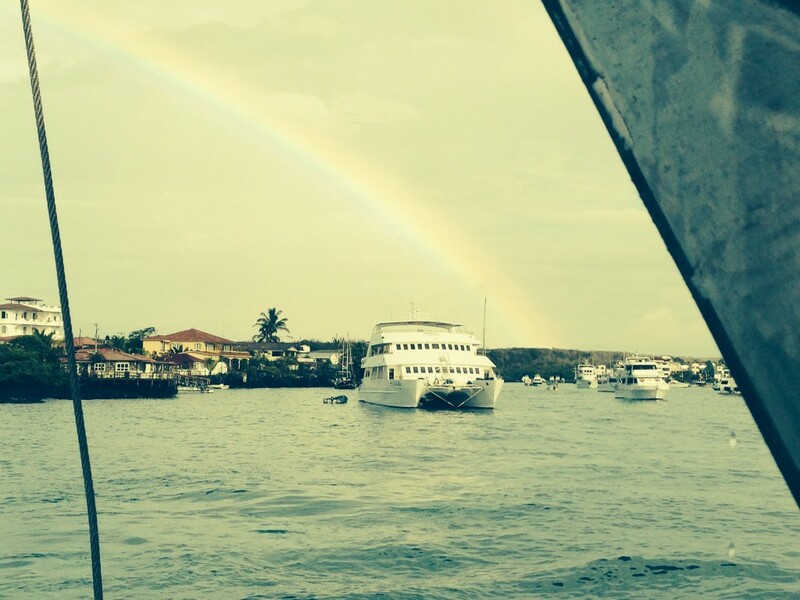 Better pay in the Galapagos lured many mainland Ecuadorians to the islands for employment. In order to preserve their islands and their employment, the people of Galapagos worked with the director of the Galapagos National Park to pass a law that only those people born or living in the Galapagos prior to 1998 could be permanent workers. I had read about some of these issues before I came, but it was so interesting to listen to someone who was living it. 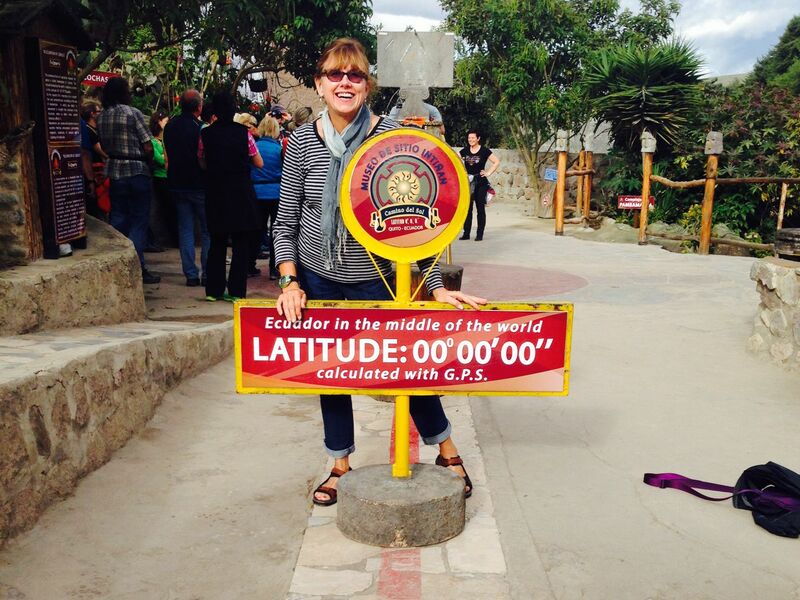 We left Quito at 4:30 AM to fly to Baltra, our first stop in the Galapagos. I immediately knew I was in a special place when I saw a sign in the airport that asked “Do you know why we are the first ecological airport?” Galapagos is a group of sixteen main islands and other smaller ones for a total of sixty-three islands about 600 miles off the coast of Ecuador. The population of Galapagos is about 25,000 people who are allowed to live on only four of the islands. 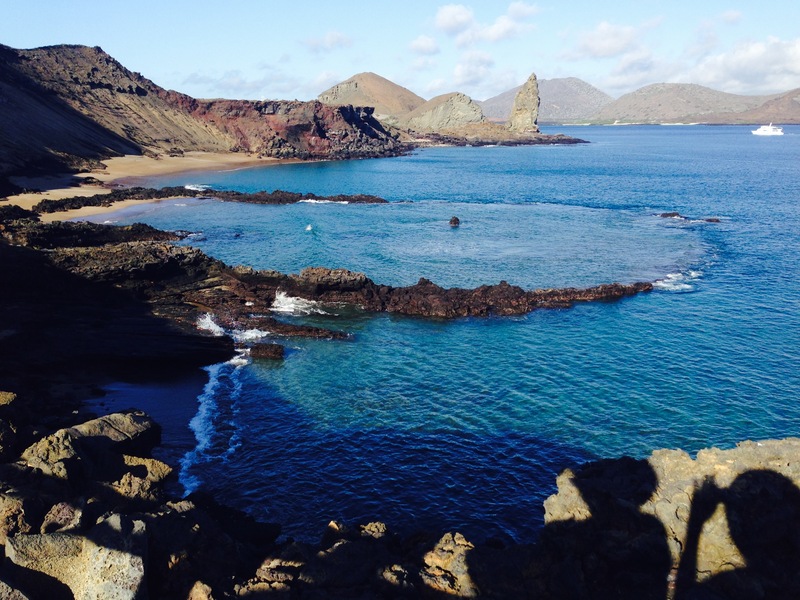 The Galapagos National Park strictly controls how many people can visit each island each day. From the airport, we took a bus to the dock, got in a panga (an inflatable boat) and rode a short distance to Archipel II, the sixteen passenger ship that would be our home for the next four days. After lunch and some time to get settled, we headed out for our first island exploration to North Seymore. Our guide had told us some of the wildlife we might see. Before we even landed, we saw a beautiful male frigate bird with his bright red throat fully expanded on the side of a cliff. Our panga driver maneuvered close to the cliff, and the frigate bird seemed to pose for us. Because there are more male frigates than females, the males are showing their bright red throats year round in the hopes of attracting a mate. Our first landing was a “dry landing” which means we go from the panga to dry land. On North Seymore we got off on a steep rocky incline and climbed about five steps to get to flat land. Our guide directed us to follow him and stay on the path as he led us around the island. The very next bird we saw was the famous blue-footed boobie. 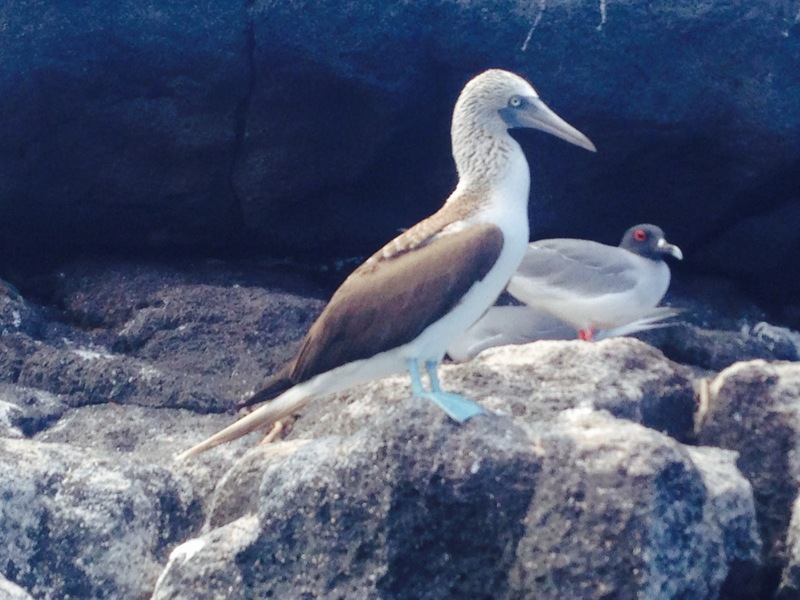 These lovely birds with their light aqua feet are only found in the Galapagos. Hiking around the brown, rocky island we also saw sea lions, land iguanas, and red-footed boobies. After feeling so excited to see our first preening frigate bird, we rounded a corner and found a large expanse of preening male, female and juvenile frigate birds. 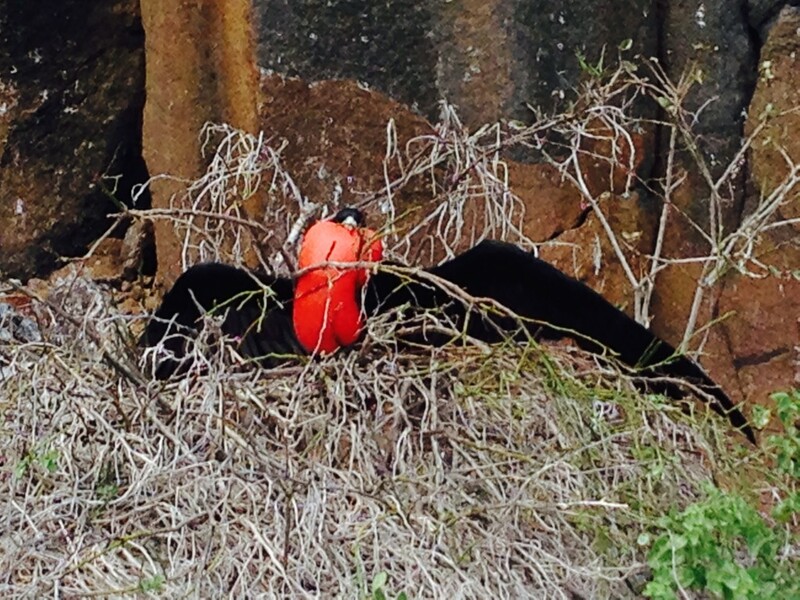 It was especially interesting to see a mother feeding her young frigate bird. Returning to our boat, we were greeted with ice cold fruit drinks by the crew. Then it was off to our first snorkle. The snorkeling was great, and my wet suit kept me nice and warm. When I looked at our schedule I had been a little worried about getting bored at night because there didn’t seem to be anything to do. Our guide assured us that after dinner we would probably be ready for bed. He was so right.